For this article, let’s take a closer look at one of the more versatile tools in your quake-preparedness toolbox, quake putty. You’ll find a few variations of this stuff under different names including Quakehold Putty, Museum Putty, Amazing Stuff, Quake Secure, and a few related products like Museum Wax and Quakehold Gel, but they all have one thing in common: they let you non-permanently stick down small objects to prevent them from falling or flying in an earthquake. Part 1: At the risk of sounding like a commercial (I have no financial interests in any of these products), that’s not ALL you can do with them. Here's a list of 20 varied uses I’ve found for this stuff over the years, and a few more as I let my imagination run wild. 4. Holding random loose parts of things so that they don’t move (like a useless D-ring on the bottom of my violin case that would flip out and interfere with it lying flat until I put a small dab of quake putty behind it; see Figure 1). 5. Blocking ants from entering the bathroom through a hole in the tiles. 6. 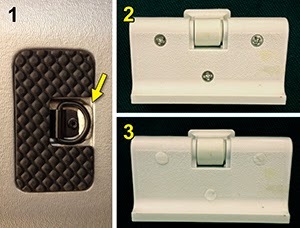 Covering ugly screws visible in otherwise white plastic; see Figures 2 (before), and 3 (after). 7. Non-permanently supporting part of cabinet touch latches that stick out over shelves (see my earlier article about touch latches). 8. Form a barrier. We had a wireless router on a high shelf a while ago that we didn’t want to stick down, because I had to access the back panel every now and then, but didn’t want it slipping off and crashing onto things below. I used quake putty to build a 3D ridge between the router and the edge; you couldn’t see it, but it would prevent the router from sliding forward without interfering with the ability to pick it up. 9. Temporarily stick a recipe to the kitchen cabinet door while cooking. 10. Hold music to a music stand if you are playing a gig outside (not great for page turns, though). 11. Stabilize loose parts (such as thermostat covers). 12. Support loose plugs that aren’t tightly held into their outlets (small bead between the plug plastic and the outlet plate). 13. Stuff it into extra switches on alarm clocks that you don’t want to mistake for the on/off switch (such as ringer volume). 15. Use as the equivalent of single-sided Velcro (having some exposed on a surface so that you can occasionally put an object there without it rolling or sliding away). 16. Temporarily fill gaps, a non-permanent alternative to silicone sealant. 17. Stop glass shelves resting on metal pegs in display cases from rattling when the door is opened or closed. 18. Stop a paper plate from flying off the table during a picnic. 19. Put a dab on your finger to help turn pages (if you are the finger-licking type). 20. ...and...stick things down for earthquake preparedness! Part 2: Quakehold Gel is a great solution but watch out for some little glitches. This is a nice product and I’m identifying it by name because, to the best of my knowledge, it’s the only such product that is clear, so I’m not endorsing one company over another. 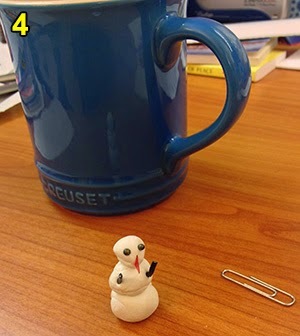 Because it is clear, you can use it to stick down clear objects like glass and crystal that might look ridiculous if stuck down with cream-colored white putty (Figure 5). One thing to watch out for is that you can’t use this stuff on porous surfaces such as unfinished wood, paper, or fabric. It also isn’t very effective on rough surfaces because it oozes, unlike the putty which fills gaps and holds them. This is best used on glass, crystal, plastic, finished wood, tile, etc. The other thing to watch out for is that, as mentioned above, it oozes. And I really mean it oozes! This gel is essentially an extremely viscous liquid. If you pull a clump out of the jar, there will be a big hole where that clump used to be, but come back an hour later and the edges will have smoothed. Come back a day later and the hole is gone; it’s a flat surface again, probably with little hazy bubbles. Come back a week later and it is a pristine clear surface. So if you put a little too much gel under an object, it might look fine for a day, but a few days later, you might notice that some of it is oozing out, as if you put too much glue under something and pressed down onto a surface. That’s ok, you can just scrape off the excess with a piece of paper or anything else, and if the remaining edge looks rough, it will smooth out by the next day. You might find yourself doing this over and over again though, so just try to be sparing with it in the beginning. 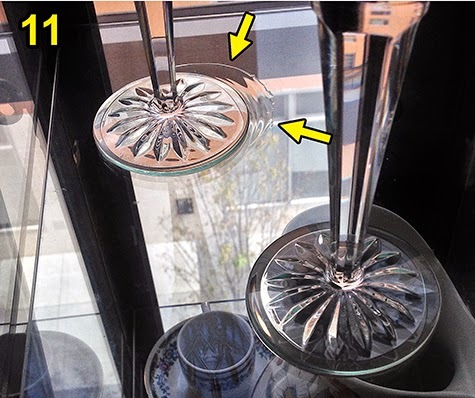 These goblets have cut-out designs on the bottom (Figure 6), and I wasn’t sure whether it would be better to put a little gel around the rim, which would leave the facets open to reflect light but might end up with an uneven rim, or to completely fill the bottom with gel, reducing the pretty reflection in the facets but keeping everything even. Well, here’s a photo of my initial attempt to fill it; lots of bubbles (Figure 7). Over time (like many weeks), the bubbles moved and coalesced, so it didn’t look that bad (Figure 8), but I missed the pretty reflections of the light in the facets. I then rolled some gel as thinly as possible and gingerly put it in a ring under the outer edge of the bottom of the other goblet, and gently pressed it down. It started out very unevenly (Figure 9), but by about 2 weeks later, it had evened out (Figure 10), and looks much better than the completely filled alternative in my opinion. However, it certainly oozed! Over the next several days, I found myself daily scraping away excess gel that was slowly seeping out from the sides. 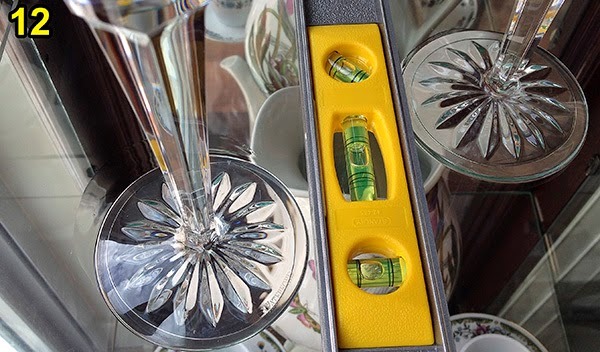 I found that a razor blade worked well, since the shelf is glass, or I could take a couple of inches of a plastic drinking straw and flatten it into a mini spatula that could scrape around the edges of the glass. Again, it looked rough around the edges initially, but smoothed out nicely afterward. I thought I was done, but a few weeks later, I saw the slime trail! 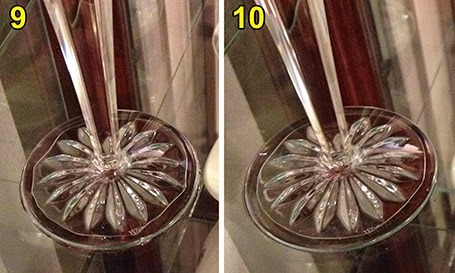 Sure enough, the glass had crept closer to the front of the shelf (Figure 11). I scraped that all away, and a week or so later, the glass had crept even closer to the front of the shelf and there was another slime trail. I confirmed with a level that the shelf was slightly tilted so the front was a little lower than the back, just a bit, but enough to make the glass slide forward in super-slooooo-mooooo (Figure 12). I put small pieces of dark brown paper under the front corners on the dark brown plastic shelf support, to prop up the front until the level said it was straight, and the glass has not moved since then; looks great. And yes, I thought about using quake putty to prop up the front, but that white stuff would have looked terrible under the glass! Sometimes, old fashioned low tech is better. One follow-up: While I have had good results using quake putty on painted walls to stabilize pictures (that are being mainly supported with a hook), there are some reports of quake putty that has been on a wall for a long time leaving either an oil mark or a residue when it is finally removed. There are different products and that may vary by product. I will make some inquiries and update this comment in the next few days, so check back! With respect to use on painted walls, the different products vary in their recommendations. Quakehold putty/Museum Putty (from Quakehold) is marketed primarily as an earthquake putty, and there are seemingly contradictory instructions in different places regarding use on walls. The product instructions online include the note that it can be used on walls to help stabilize pictures. In other parts of the instructions, there are caveats about use on porous surfaces, and various people have reported oil stains on flat paint walls as mentioned above. I checked with the folks at Quakehold, who said, "Not recommended for flat, semi- flat painted surfaces… Any surface porous or absorbent could also leave oil residue. Goo gone and goof off on non porous surfaces will remove most residue, but not oil penetration. Works perfect on wood that is sealed, glass or other hard surfaces. Do not above all put on wallpaper." On the other hand, the product into for Amazing Stuff and Quake Secure (which are two names for the same product) both make a much stronger marketing pitch for the use on walls; rather than an afterthought; they market their product for quake securing and for wall use. Personally, I have found the Amazing Stuff to be softer and stretchier than the Quakehold putty, meaning that the Quakehold putty is easier to reuse without the "chewing gum on the shoe" effect. So, perhaps the safest approach is to use Quakehold/Museum putty primarily for the purpose of sticking things down, and Amazing Stuff/Quake Secure as a preferred product if you want to use it on non-glossy painted walls. I can't guarantee that Amazing Stuff won't leave an oil mark, just passing this along. Either way, none of these should be used as the primary structural support for anything other than paper. And the folks at Quakehold also stress that the Quakehold Gel should never be used on a wall, which makes sense given my notes about objects moving on shelves if given even the slightest tilt. I have a similar question. I have a small wood object I want to place on top of a stump. Just want to secure it so it doesn't get knock off by an excited squirrel. It will be on my patio. I don't have any experience using quake putty outdoors, so I am not sure what happens to the tackiness when subjected to variations in temperature and humidity, including expansion and contraction of the objects. The putty itself is quite waterproof but I am not sure about the bond. I know that you can't stick it to a surface that is already wet. The putties are reportedly for use on non-porous surfaces but I have found that they stick reasonably well to unfinished wood if you hold the object to be stuck in place for several seconds. It's not as strong as sticking it to a finished surface but it works. If the stump surface is at least smooth and flat, I believe the putties would stick. I just don't know if they will remain stuck on hot days, humid days, or if the stump and object are in the rain. I just tried putting a little Quakehold putty and Amazing Stuff on the bottom of an unfinished bamboo cutting board and sticking little unfinished wooden bowls to them. They both stuck, and I held it under running water sideways for about half a minute (just a bit, we have a drought here!) and they did not loosen at all. In fact, the area covered by putty was still completely dry when I peeled it off. Whether this situation would persist after months or years exposed to the elements is something that I simply can't model though, so if you do this, I would suggest checking it a day later, a week later, a couple of months later, etc. just so that you know if it is still strong. Perhaps you could even reply to this thread in a few months if you do this to let us know your results. Of course, if you see an excited squirrel laughing and running off with your precious object, then you'll have your answer sooner. By the way, the Quakehold Gel truly does need to be on non-pourous surfaces. Thanks for this! I'm going to pick some up for my husband's woodturnings at an art show this weekend. However, I'm going to read the labels carefully for information on porous surfaces. We've had his things in a show before and the Museum Wax that the organizer used was hard to remove and did leave slight stains on the bottoms of some of the wood pieces. Eventually, the stains blended out into the wood and are now not noticeable, but it upset my husband at the time. He puts a lot of effort into the finishes of his pieces, so having those little oil spots was distressing. I have a house full of rescue kitties that won't be going anywhere, as their "issues" make them unadoptable. And I have Christmas decorations that I would like to set out....they are "breakable." Can this product be used to hold them in place on a sealed granite countertop? But assuming the question is whether the breakable Christmas decorations stuck down by putty can withstand the antics of cats trying to play with them, that's a great question. I can tell you that depending on how flat and smooth and non-porous the base of the object is, I have sometimes had to work reasonably hard to dislodge it if I needed to. However, that's me trying to remove an object in one piece from the shelf or whatever it's on. My experience with cats is that they are, well, less cautious about the well-being of an object of their interest... I think there is a good possibility that the decorations would remain on the surface but the odds of the cat winning and knocking it over are high enough that I would not suggest it. Perhaps you can try sticking one down and carefully mimic what a cat might do, and decide on a case-by-case basis. Good luck! You answered my question to a "T". Thank you! Hi I have a smooth surfaced cherry wood hutch,i want to put a glass vase on top ,but I have a cat...will it stay secure? However, for feline considerations, it's really hard to predict without knowing how heavy and stable the vase is, and how active the cat is. I think quake putty would be better than gel if you are suspect the cat might be frequently brushing up against the vase. Like I mentioned in an earlier reply, you might have to try the experiment and stick down the vase, and try to mimic what the cat might do. These object can be pretty darned stuck. I should mention either way that the bottom of the vase needs to be flat for this to work, and hopefully as wide as the rest of the vase for the best chances it can withstand cat antics. Hello, I have an unusual problem, it seems. I used museum gel to anchor a medium-large glass sculpture, which weighs several pounds, to a smooth granite surface. Now, I'm preparing to move, and I CAN'T REMOVE IT from the surface. I've tried everything I could think of, rotating it (it won't budge), applying heat, cleaners, etc, and nothing will break the seal. Thanks for replying. It's Clear QuakeHold! Gel. Also, the sculpture has a large flat base, about 5"x8", which now seems "suctioned" to the smooth granite countertop. "Fishing line under back and forth like flossing your teeth while someone holds statue firmly with both hands. Once removed, roll gel into balls back and forth over product until most removed from surfaces. Then you can use Windex or simple green to remove completely. Let it soak in. If piece has signature, avoid doing that in signature area." Thank you so much! I'll try this and let you know how it went. I really appreciate your help. Good luck! I’ll be curious to hear how it worked. I learned something also from this. Unfortunately, the scupture is still stuck to the granite counter top. I've tried fishing/jewelry monofilament line, heat, nail polish remover, and brute strength. None of this has worked, and I'm moving in less than two weeks. Yikes! Did you contact Dean? I am wondering some solution to a similar problem. Somo glass, marble and porcelain were fixed with museum gel, which seemed to be a great solution at the moment, but one month after we see that the gel is melting and the contact surface got larger... we are facing the difficult of remove those objects. Would you tell me which products can be used to try the take off? Thank you so much. I've experience momentary panic situations trying to remove something with quake putty after many years, but they have always come up ultimately. I've never experienced this with the gel and I wonder what the difference is with you and with the previous reader's comment. On the other hand, I've only used the gel on small objects; I don't think I have used it on a base larger than about 5 inches in diameter. You presumably say Dean Reese's note about the fishing line being used like dental floss. Actually, I wonder if actually using dental floss, the waxed variety, would work; not sure. But I don't interpret that the gel melts; you've probably noticed that it is never truly solid. Putty keeps its shape, but that little tub of gel will slowly move to fill space and if you store it tilted, the surface will be tilted. So it does tend to flow if you have too much of it. Although I'm still intrigued that I have not seen it called museum gel, just quakehold gel; although it sounds like it should be the same thing. All I could suggest is that rotating is usually the way to free these products, so perhaps having two people, one flossing and another rotating, could do it. If you had a little water at the seam that would flow into the slightest gap, I wonder if that would help. Well, I'm really sorry that some folks are having these problems; it's news to me and I've never experienced it. I'm assuming these are the extreme exceptions or else we would be hearing more about it, but let me know if you found a solution. If there's no danger of scratching, perhaps a gentle razor blade insertion? Hi Matt - your comments about QuakeHold Clear gel are great. I've been using it for years - we live in earthquake country (SF Bay Area). I still have the original jar that I bought decades ago, and it has almost half the original amount left - that's how little I use each time. I was just checking online to make sure that it is still available if I ever need to buy more, and I saw your posts. 1. Holding down a box of Kleenex tissues on my desk, so I can grab a tissue with one hand without having to hold down the box with my other hand. I work at a computer from home all day, and I have pet allergies (and two cats), so I'm constantly reaching for a tissue while I'm working. 2. To secure gift cards inside greeting cards. We have 3 children and 7 grandchildren plus their spouses, so we give a lot of gift cards for birthdays, Christmas etc. I just put a tiny dab of the gel on the back of the plastic gift card and stick it to the inside cover of the greeting card so that they don't get separated during the excitement of opening gifts. Thanks, those are great other uses! Kleenex boxes are an important part of my life also so I know what you mean; especially if you have the annoying square boxes that just lift up with the tissue! I'm also having a problem with my items being stuck. I used the earthquake putty. I have had the items attached for 10 years and now it's time to move and they won't budge. None of the items have a surface over 5 inches. Thanks, I saw this as it was coming in. I've had my fair share of "uh oh it's stuck" moments as I have prepared to move over the years, twice after ~10 year residencies, but while I know a couple of commenters here have had some real problems that I hope they managed to solve, I have always been able to overcome the problems. What are the objects and the surfaces that they are on? And did you use small bits of putty under several places or does the entire base have a thin layer of putty under it?